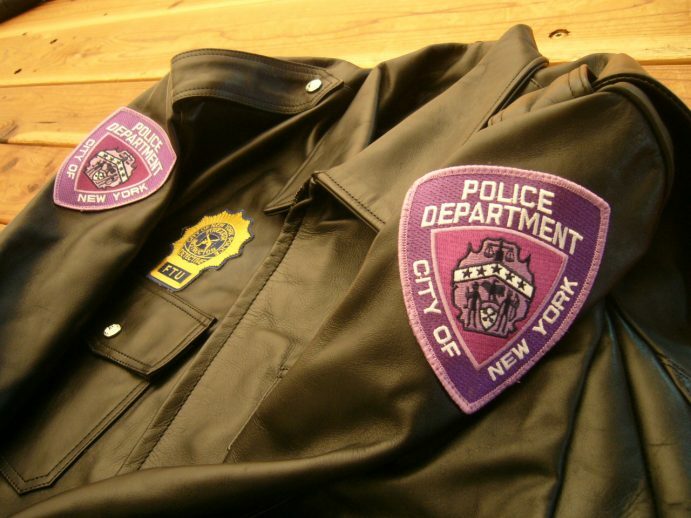 After 9/11 New York City itself found a way to make millions of dollars.. by selling “Officially Licensed New York Police Department” hats, shirts, jackets, beanies.. everything! 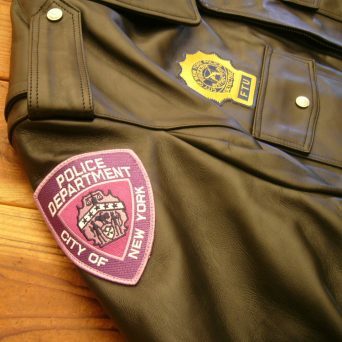 From the Manhattan Daily Press, Murray Weiss “MANHATTAN. 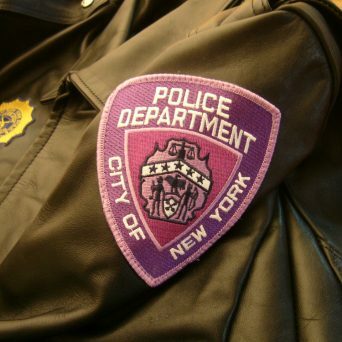 Everyone loves the NYPD. Souvenir shops around the city sell millions of dollars worth of hats, T-shirts, jackets, and other NYPD gear emblazoned with the letters “NYPD” or the police department’s logo. 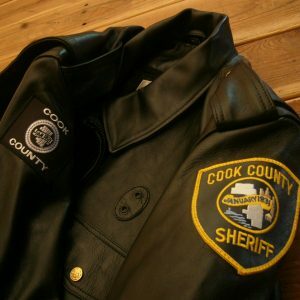 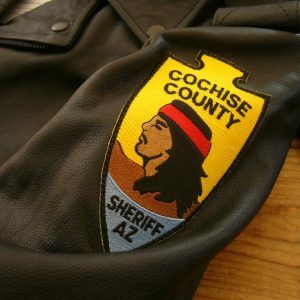 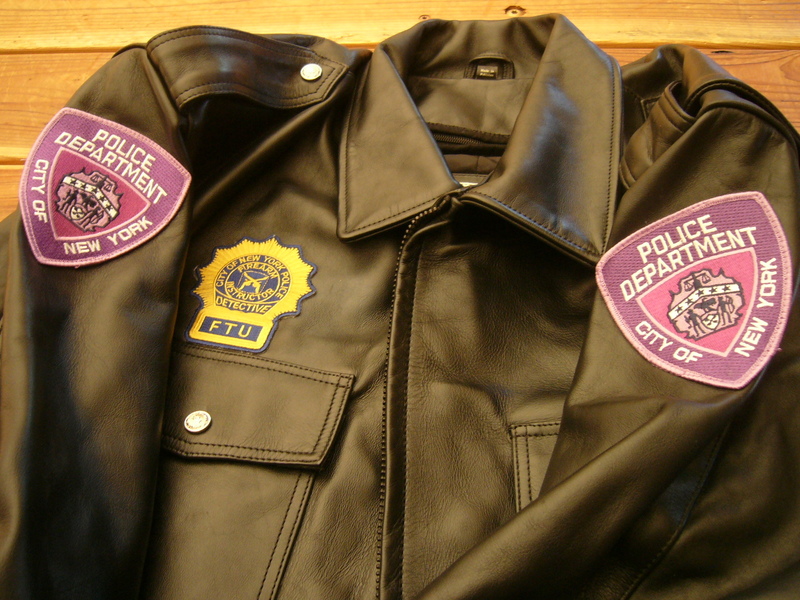 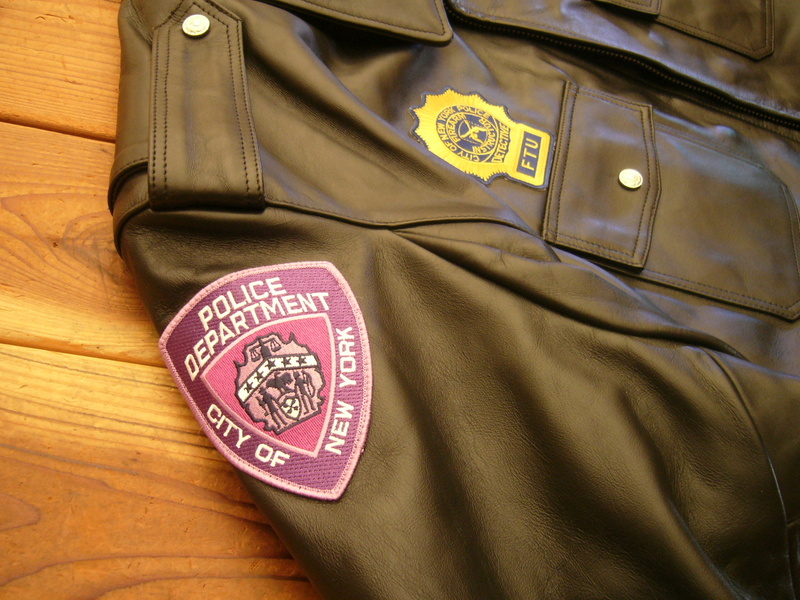 Anyone can own their piece of the police pie except the city’s 35,000 cops. 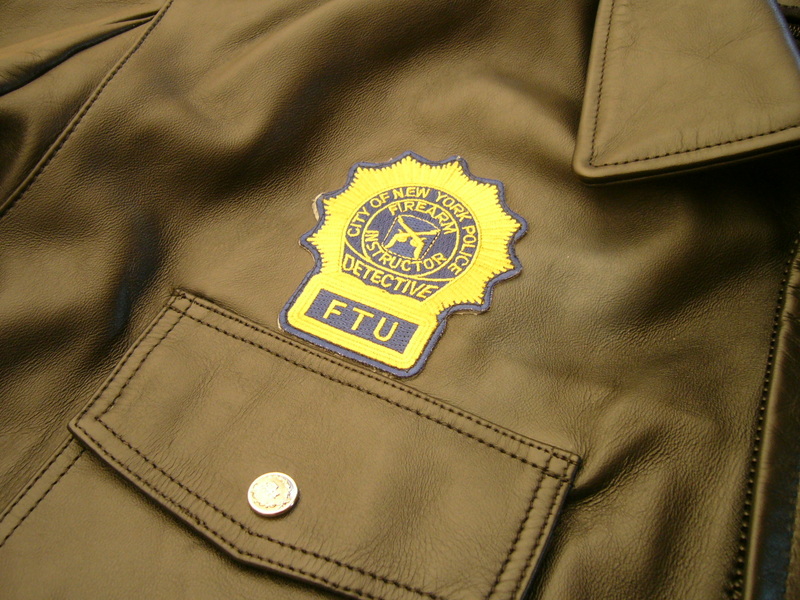 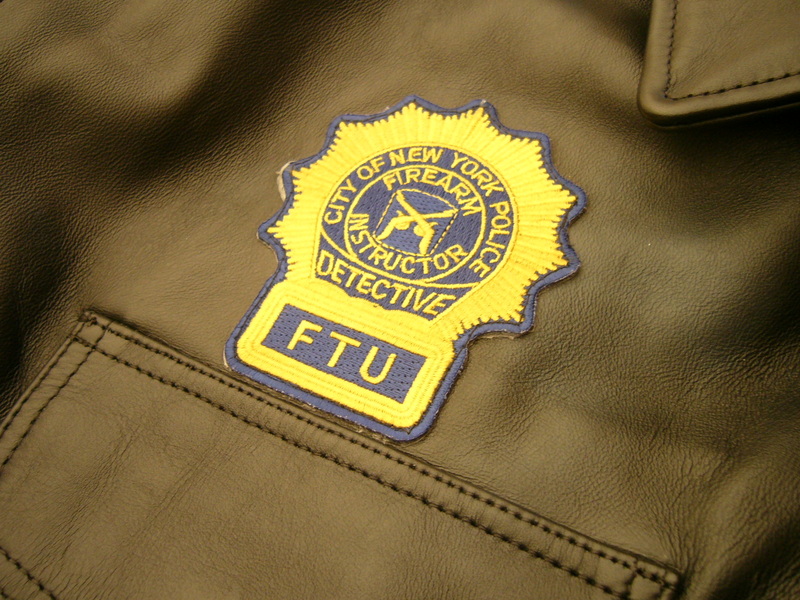 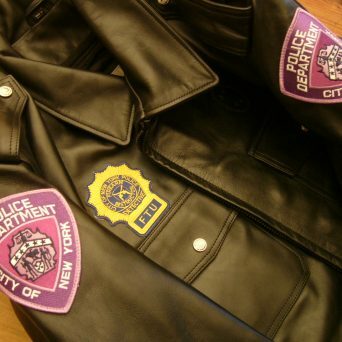 Under a new NYPD directive, the Police Commissioner has forbidden New York’s Finest from owning any T-shirts, jackets, pins, pens, or any other item with the NYPD letters or insignia on them except, of course, for their own uniform. 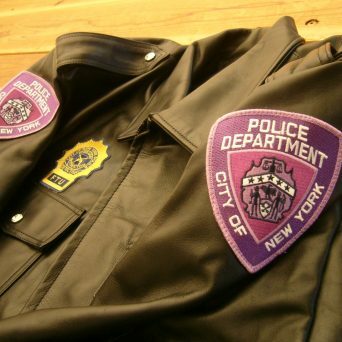 No more donuts with coffee in NYPD mugs, either. 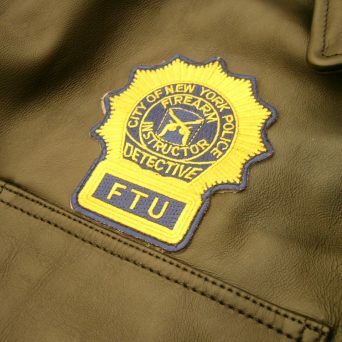 Long story but you get the idea. 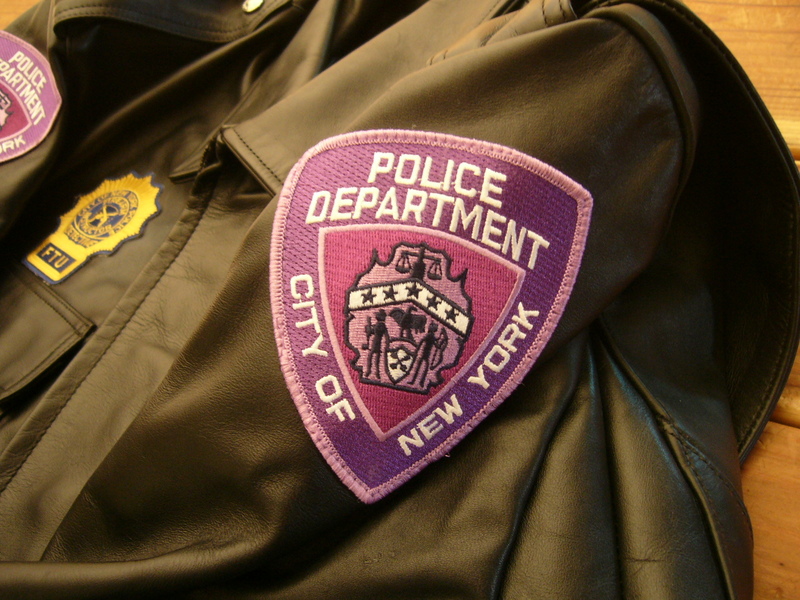 Civilians IN NEW YORK can legally wear all kinds of NYPD gear as it is officially licensed and New York makes gamillions of dollars of it.. but cops can only wear their gear on duty! 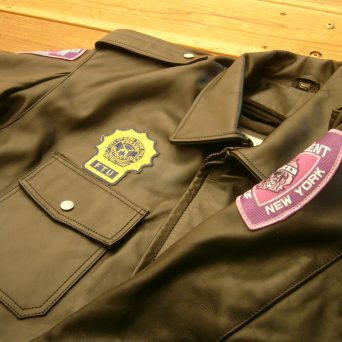 Brand new never issued massive winter coats w/ premier drum dyed leather weighs in at 8lbs for an XL with the Thinsulate liner (all sizes available including Long). 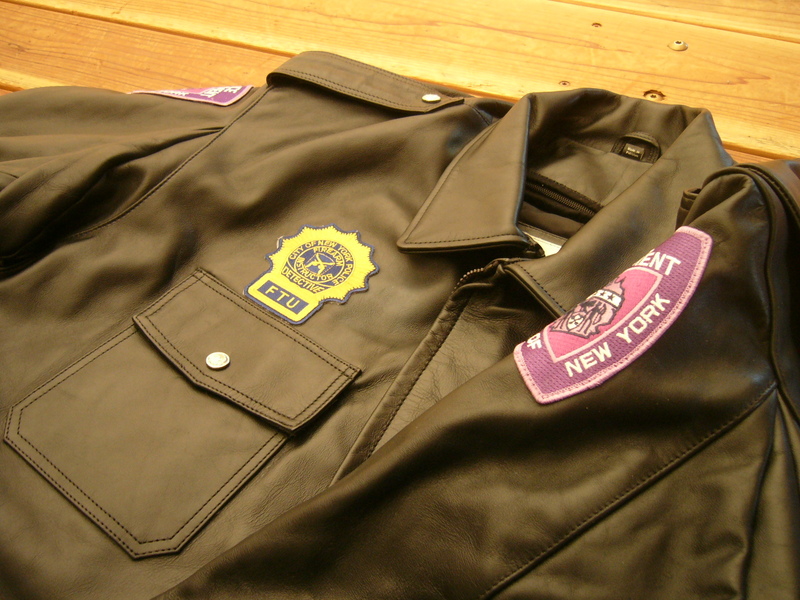 Monster weather slaying thick leather slays snow, rain, sleet, hail. 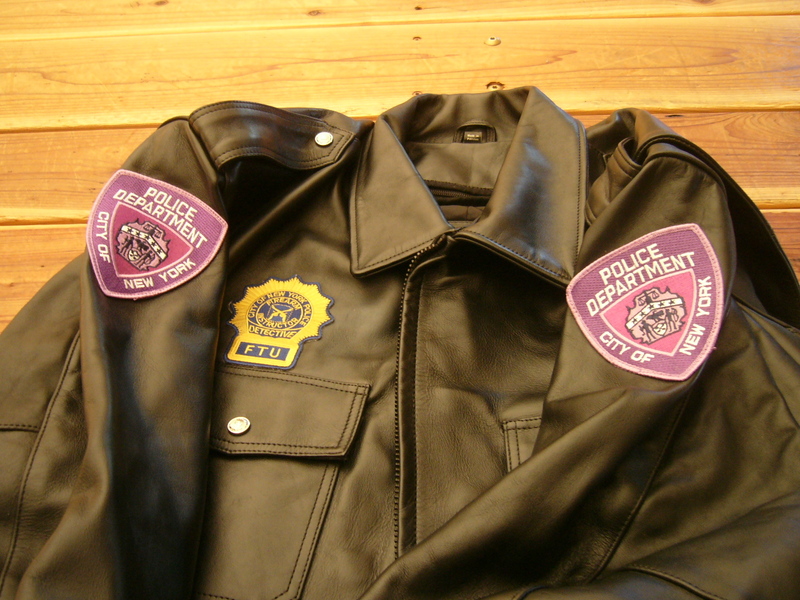 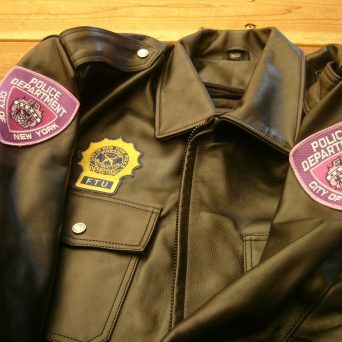 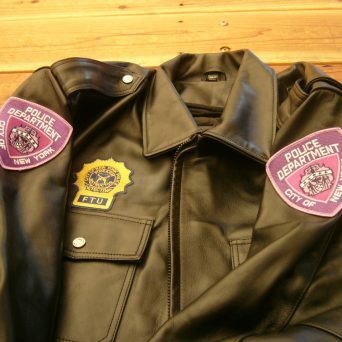 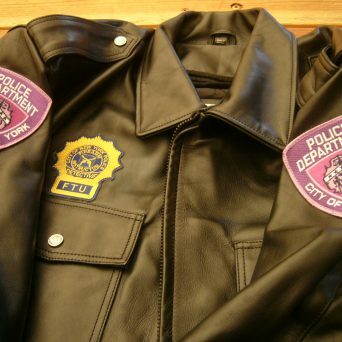 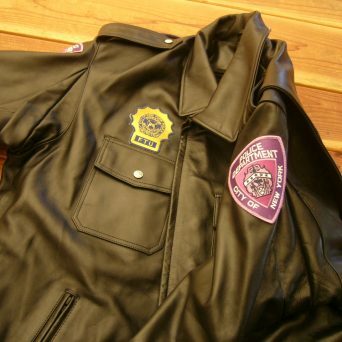 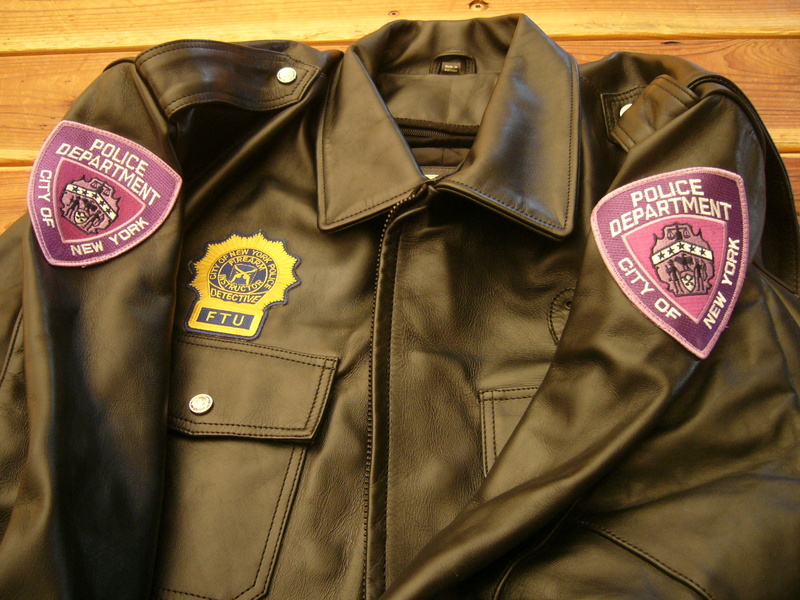 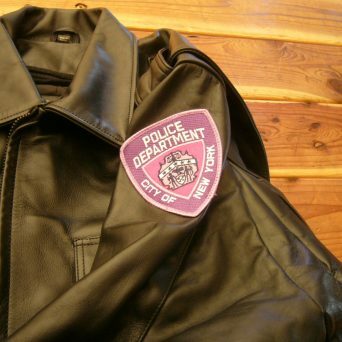 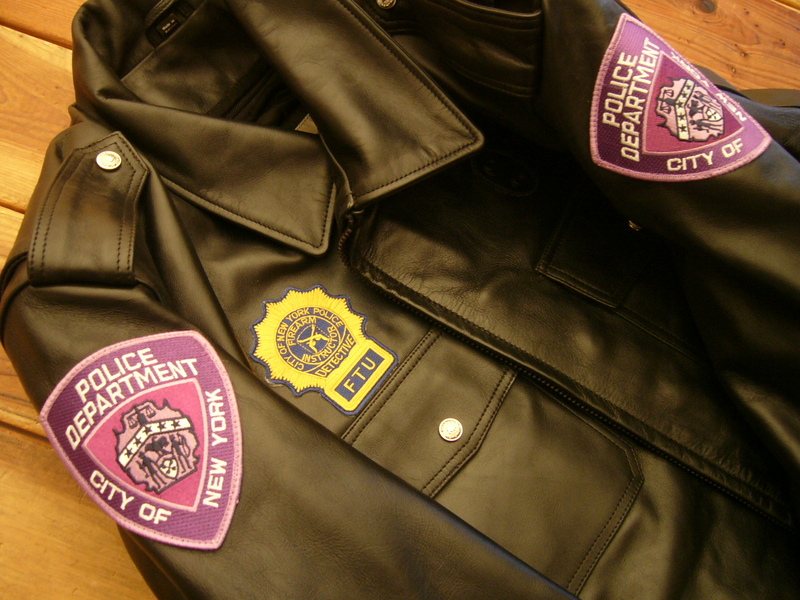 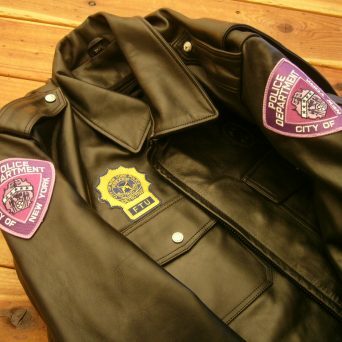 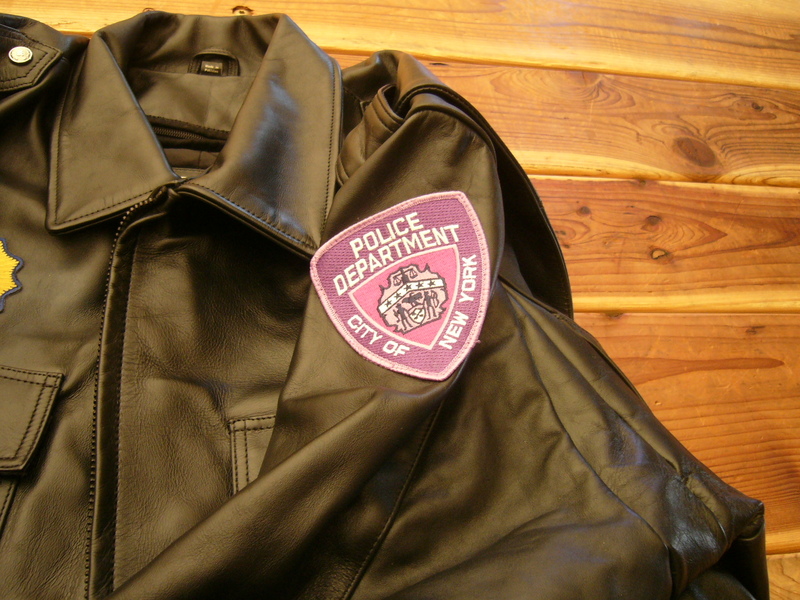 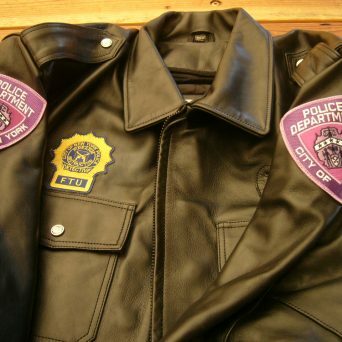 According to the NYPD’s own internal contract specifications this leather jacket can withstand golf ball sized hail at 66 mph with no permanent damage! 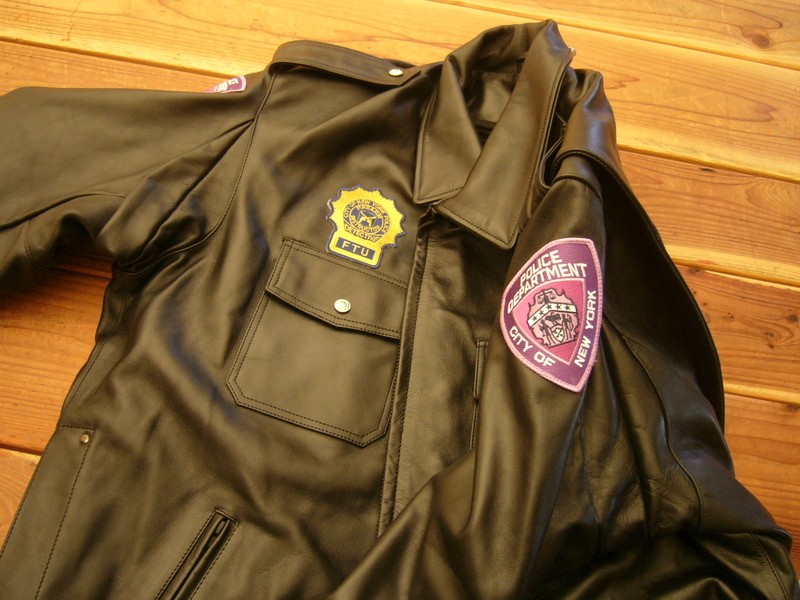 Minus degree weather with layers you are in like Flint; zip out liner makes weather in the 60’s a joy. 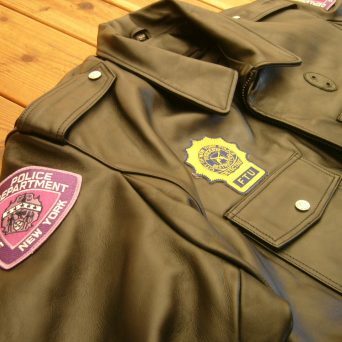 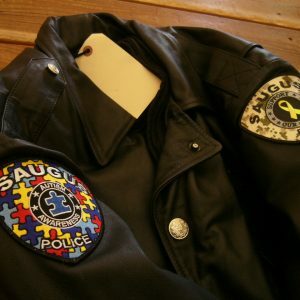 Longer jacket covers your entire arse and is available not only in this specific style jacket but ALL Rockegroup, LLC issue leather and is also available in all sizes. 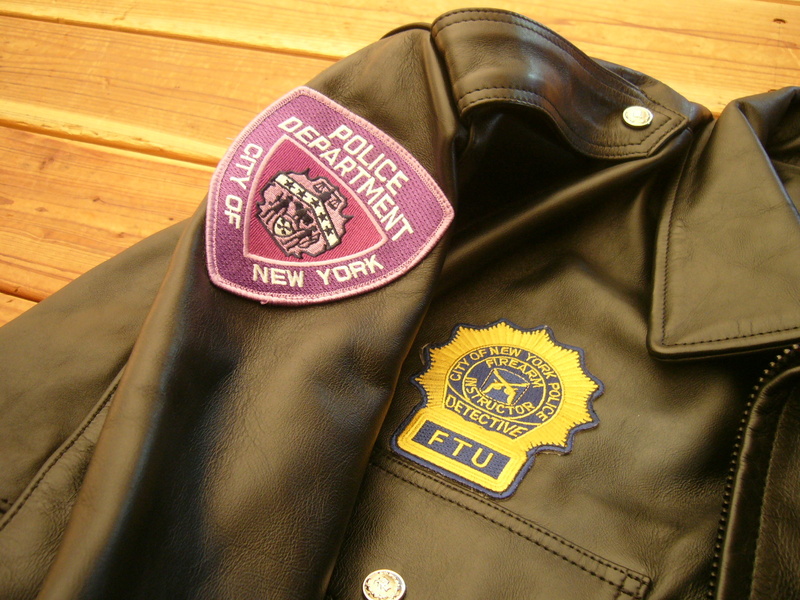 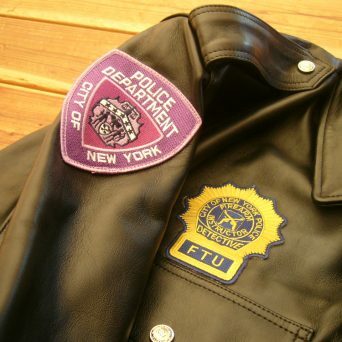 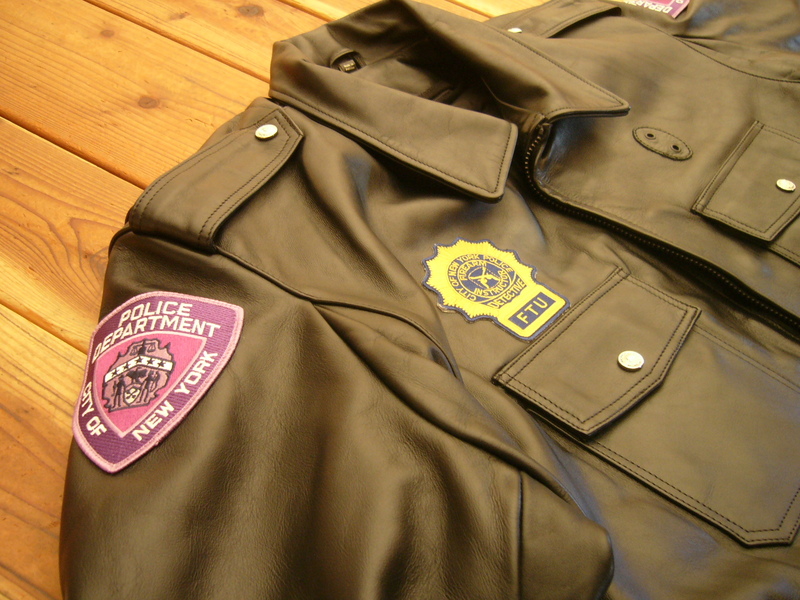 Official “Breast Cancer Awareness” NYPD patches both shoulders with the FTU (Field Training Unit) Firearm Instructor Patch. 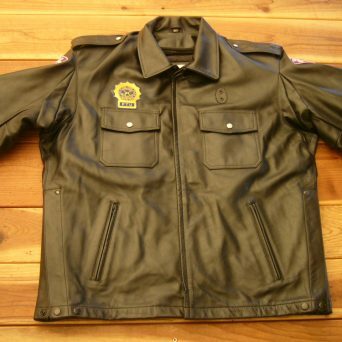 Exceptionally appealing aesthetically; wondrous fashion statement which also show’s you truly “care”. 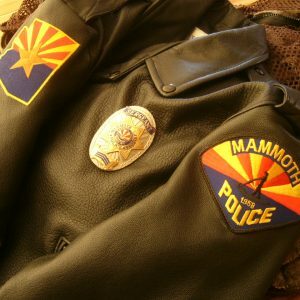 This long jacket can be worn sitting or driving as it has dual blackout YKK Extreme zippers in the front allowing you to zip partially (or all the way) up and or down. 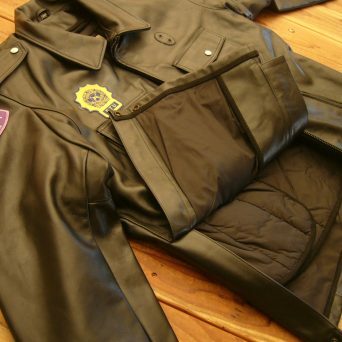 Along with the 11 inch side slits which open (see pictures) sitting or accessing interior pants pockets is a breeze. 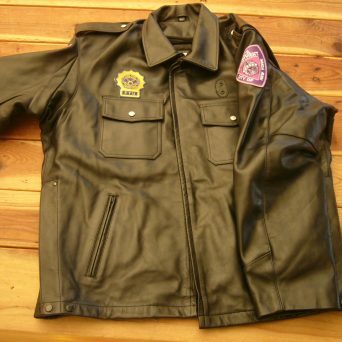 One of if not the most expensive police jacket’s to manufacture it includes YKK “Exteme Duty” zippers, underarm ventilation grommets, double stitched pockets, Screw on/off buttons, Thinsulate linings, side snap system, tri-swing back (a.k.a. 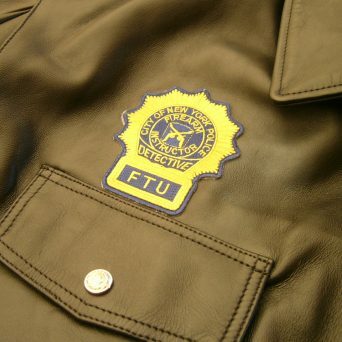 Drop-shoulder) design for unrestricted movement. 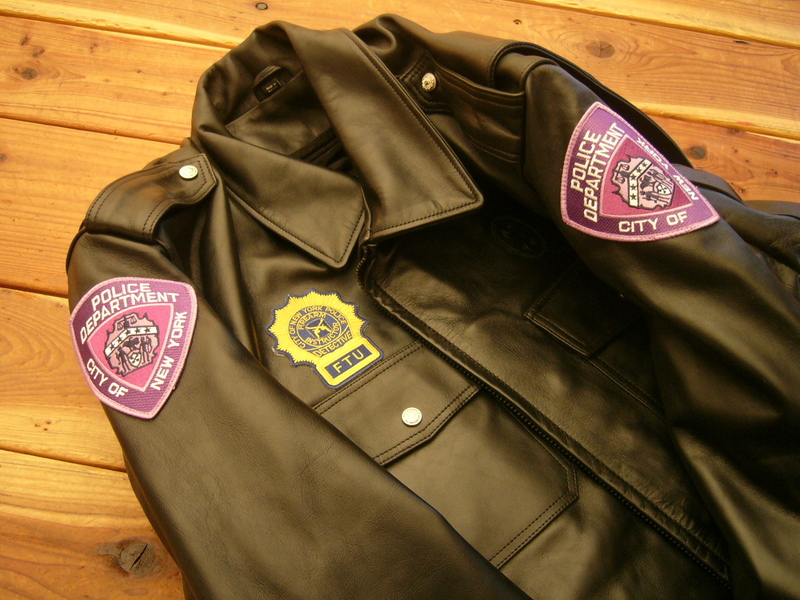 Epaulets sewn at each shoulder with button affixed at opposite end w/ silver Gothic Museum “P” (Police) buttons standard (25 Ligne = 5/8″ dia.). 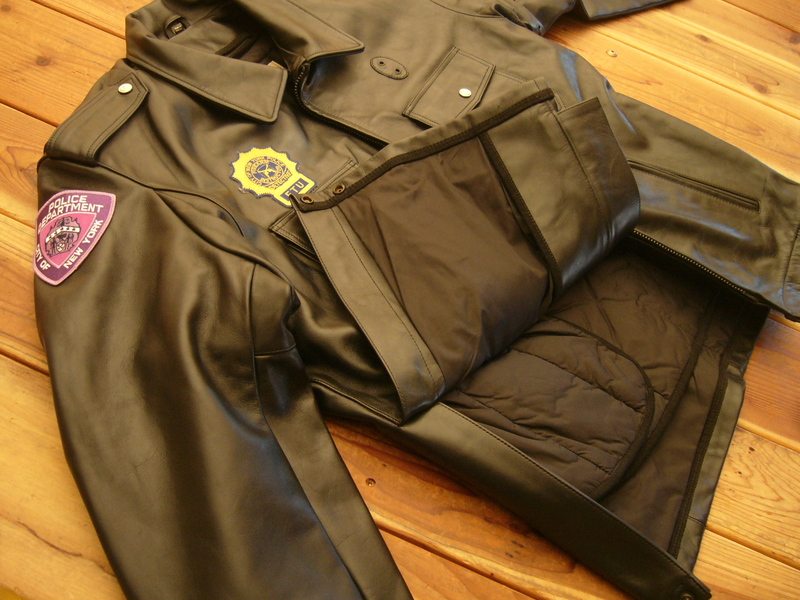 4 Interior Pockets (2 with Zippered Closures). 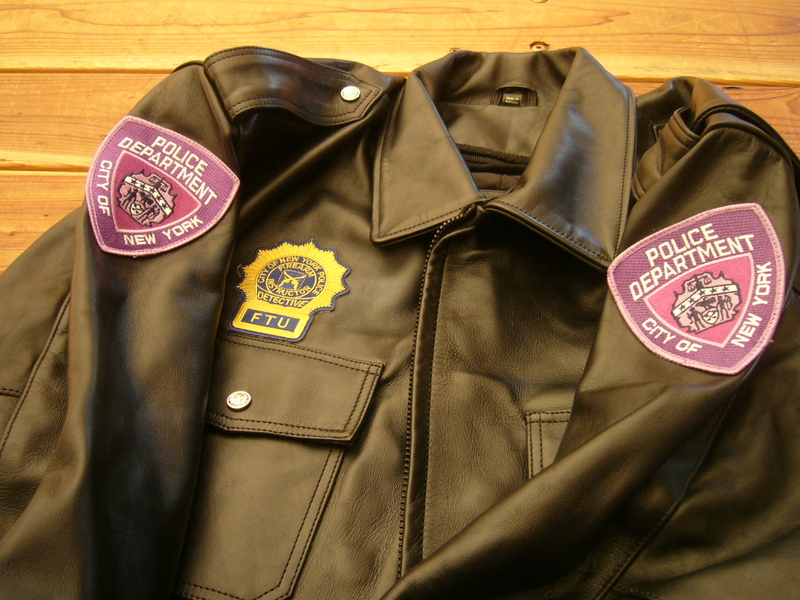 2 Dual-Entry pleated breast/hand pockets w/flap and affixed buttons (velcro), Silver “P” buttons standard (25 Ligne = 5/8″ dia.). 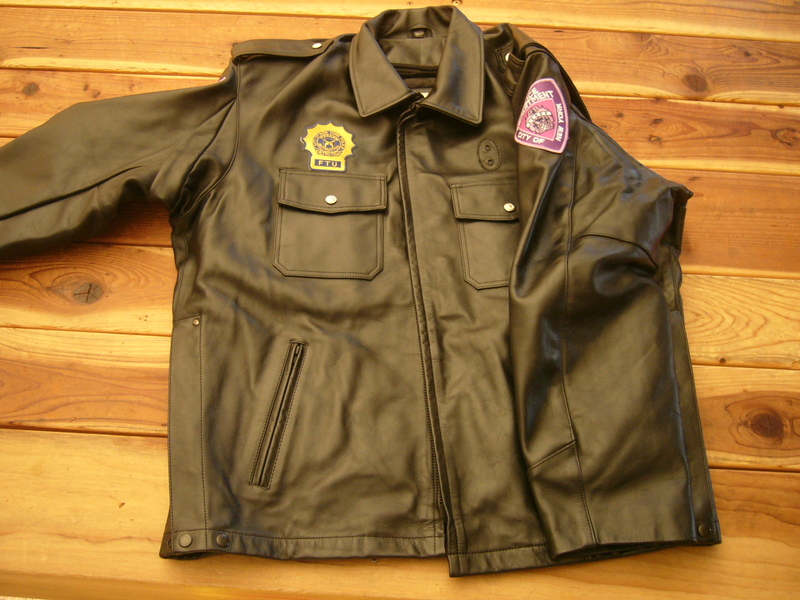 Side/Waistband zippered side vents for relaxed fit while seated w/ equipment/weapon access. 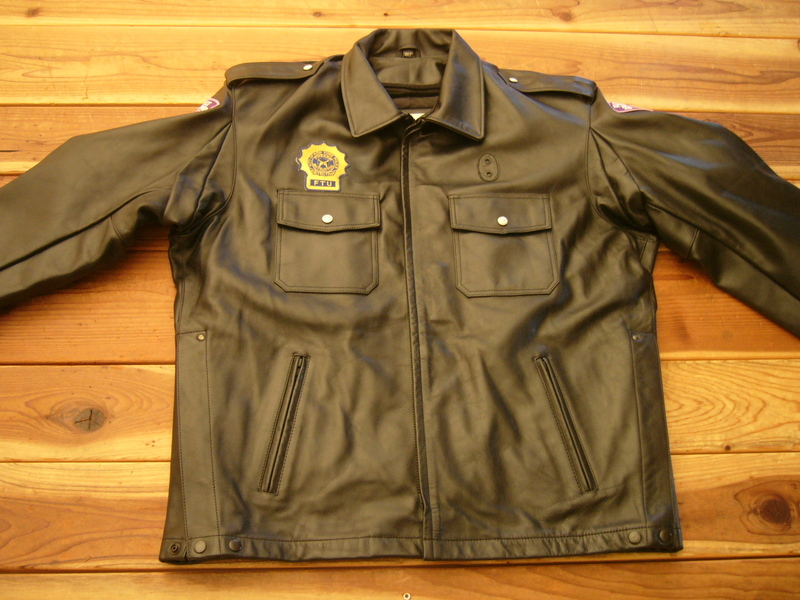 Front closure storm flap, sleeve/cuff knit nylon “Storm” cuffs sewn into sleeves.